On a high tree covered mound between the Teviot river and the Tweed river south of Kelso, sits the rubble remains of the once majestic Roxburgh castle. The castle was fought over time and again by the Scots and English as it was originally a Royal Scots castle since at least 1128. But like Berwick it was seized and occupied by hostile English, thus the castle became a thorn in the side of Scotland and locals suffered as a consequence. It was finally destroyed by the armies of King James II of Scots (1437-1460) and George the 'Red' Douglas,4th Earl of Angus in 1460. Unfortunately, the king was killed during the siege when one of his cannons the 'lion' exploded also wounding the 'Red' Douglas. The Queen who was had been staying at Hume castle raced to the siege with the young Prince James to encourage the dishearted army. Douglas was well enough several days later to crown King James III (1460-1488) at Kelso Abbey. Roxburgh was then taken by storm and torn down to ground level. It is unlikely that the English garrison received any better treatment as there appears to have been no prisoners taken. 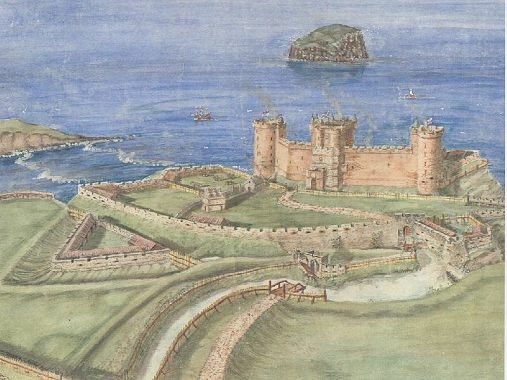 Later in 1547,during the wars of the 'Rough Wooing', where by use of warfare the English hoped to force the marriage of the English Prince Edward to the infant Mary Queen of Scots (1542-1587),a large timber and earthwork fort was built on the stumps of Roxburgh but this was also cast down. This goes some way to explain the state of the castle ruins today. What is misleading about the strength of Roxburgh is that since 1460 the river Tweed has moved north away from the castle site. Originally the Tweed and Teviot rivers almost merged around the site. So a great fosse was cut between the two rivers and a partial dam of the Teviot was used to flood the fosse into the Tweed, creating a three sided moat. An ingenious piece of engineering in itself, but taken that this 'island' was capped by at least eight towers linked by battlements and a Donjeon towerhouse, it must have presented a formidable appearance to any would-be attacker. In 1314,James the 'Black' Douglas and his men (disguised as cows) chose to attack by stealth at night using Sim Leadhouse's latest invention rope ladders which hooked onto the end of extra-long spears. Then at spears length and arms length these unfurled ladders were raised and snagged onto the castle battlements. Probably scaling the gatehouse in the top left of the conjectural reconstruction beside the Teviot. At this point a Border myth must be mentioned, allegedly a woman was cradling her baby on the castle battlements singing "hush ye, hush ye, the Black Douglas will no get ye". Then suddenly the 'Black' Douglas appeared on the battlement beside her and kept her safe while the garrison was engaged by his men. In other accounts it appears the case that Sim was the first person onto the battlements and he simply threw the guard on duty off the wall. There is no mention of a woman or a baby in this version. Whatever the truth in these tales Douglas and his archers did quickly silenced the guards seizing the courtyard and opened the gatehouse to allow other men 'grazing' nearby to throw off their animal hides and enter by storm. As the alarm was raised the English garrison with their Gascon Governor held out in the Donjeon tower. The Governor defiantly mocked the Douglas from the battlements in reply he received an arrow in the side of his face, which passed through both of his cheeks and was left gripping the shaft of this arrow between his teeth. This quickly brought the Governor to his senses and he agreed to surrender on condition Douglas escorted him to the Border unharmed as many of the locals in the Kelso area had reasons to kill the Governor because of his treatment of the civilian population. However, after the death of the 'Black' Douglas in Spain at the battle of Teba in 1330, Roxburgh along with several other Scottish castles fell back into English hands. In 1356,the 'Black' Douglas's nephew William 1st Earl of Douglas unable to attack Roxburgh directly "set upon" it's Governor and his marauding army as they passed through Ettrick forest. William "slew great numbers" but a reserve army was quickly sent north to reinforce the token garrison at Roxburgh. In 1378,William with his cousin Archibald the 'Grim' Douglas (an illegitimate son of the 'Black' Douglas) and George Dunbar, Earl of March routed an English army from Berwick at the battle of Melrose, taking many captives for ransom a lucrative income. The English complained that "the Earl of March and Douglas, and the latter's cousin Sir Archibald,....are harassing the English Borderers by imprisonment, ransoms, and otherwise." We find this practice a few years later when the new Governor of Roxburgh was snatched by the Scots before he could take up his post. The report states, "Ralph Baron of Gaistock complains to the King of Castile and Leon, (and to the) Duke of Lancaster, that having been lately appointed one of the Wardens of the March with the Earl of Northumberland, with the keeping of Roxburgh Castle, while on his way there to take command, he was made prisoner on the English side by the Earl of March of Scotland and put to heavy ransom, which he cannot pay without being totally ruined for the rest of his life...."
In 1385,William's son and heir James,2nd Earl of Douglas along with Archibald the 'Grim' Douglas (later 3rd Earl of Douglas), having burnt the lands from Newcastle to Berwick and sacked Wark castle resolved to take Roxburgh. But their siege was abandoned when the Duke of Lancaster with a large army marched north. Instead of engaging the superior English forces head-on as they attacked Jedburgh then on Edinburgh. The Douglases sidestepped heading south-west burning the lands from Carlisle to Cockermouth, as nothing would destroy the momentum of an invading English army more than the news that their homes and families were under threat. 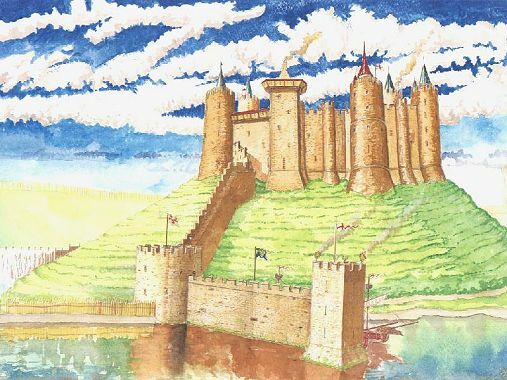 In 1398,Archibald the 'Grim's' son, also Archibald, Master of Douglas (later 4th Earl of Douglas) and Sir William Stewart burnt Roxburgh town and bridge but were unable to assault the castle. 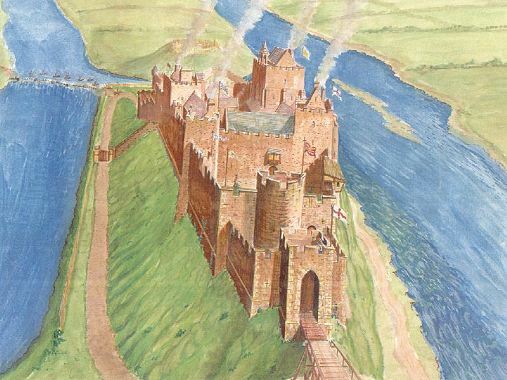 Again in 1411,another Douglas, William of Drumlanrig castle (a son of the 2nd Earl) and Gavin Dunbar burnt Roxburgh town and bridge but, "the reduction of the castle they did not attempt, being unprovoked with all things requisite for a siege." In 1416,a lengthy report to King Henry V of England (1413-1422) detailed the amount of repairs required to strengthen Roxburgh as it was literally falling down. This report may have been fallen into the hands of Archibald 4th Earl of Douglas who, in 1417,besieged the castle with a large army. Surprisingly, the English were able to hold off the Scots despite the castle's poor state and somehow during the siege, cannons were smuggled into the castle from London and then used to bombard the Scots camp. Lacking such firepower to reply Archibald abandoned the assault. In 1436,Archibald's son, yet another Archibald,5th Earl of Douglas,2nd Duke of Touraine returned to Roxburgh to help King James I of Scots (1406-1437) to hopefully achieve what his father had failed to do twice - tear down the castle walls and enter by storm. The King had a huge army, sporting "..fine, large guns, both cannons and mortars," manned by German gun crews under the command of Johannes Paule "Master of the King's engines." There was also a substantial contingent of Highland archers sent by the MacDonalds and a general mixture of men-at-arms from the Lowlands. Including the forces of Archibald's distant kin and rival, William the 'Red' Douglases of Tantallon castle. However, these many elements were not used in unison since the King gave overall control of the siege to his incompetent young cousin, Robert Stewart, instead of either of the Douglases who were both battle-hardened Border veterans, March Wardens. This caused "..a detestable split and most unworthy difference arising from jealousy." within the Scots camp. Also, such a large host "living-off" the land around Kelso during harvest time was an unfair burden on the civilian population who were adherents to the Douglases since Archibald held Sprouston and William held Jedworth Forest. So when locals clashed with the King's foreign mercenaries, the Douglases sided with the civilians. With the Scots camp split, the siege disintegrated into a complete fiasco. Lacking leadership, units simply drifted away. The Queen arrived to warn her husband that, "...certain princes of the realm were conspiring against him;" a plot was afoot to kill him, "...and when the King became aware of the arrival of the Archbishop of York, the Bishop of Durham and the Earls of Northumberland with a force of northerners, he and his whole army fled," leaving behind his expensive "shooting equipment." Which was then taken into Roxburgh much to the delight of "Ralph Grey, then captain of the castle, with 80 men-at-arms." Because of this humiliating defeat, the loss of the cannons and many other miscalculations by King James I, he was later killed by rebel Lords at Perth in 1437. Finally, Roxburgh was destroyed in 1460 at the price of King James II's life. It took this Royal death to unite the squabbling Scots in one purpose - to fell this Royal fortress once and for all. In the 1416 report on Roxburgh, one of the towers was called the "Douglas Tower"- a fitting tribute to the 'Black' Douglas assault and the persistence of his kin who tried again and again until this thorn was shed from Scotland's flesh.